This week, we hear from 2019 Best Horse Practices Summit presenter Alayne Blickle. Alayne travels internationally to promote her work around Clean Water for Horses. 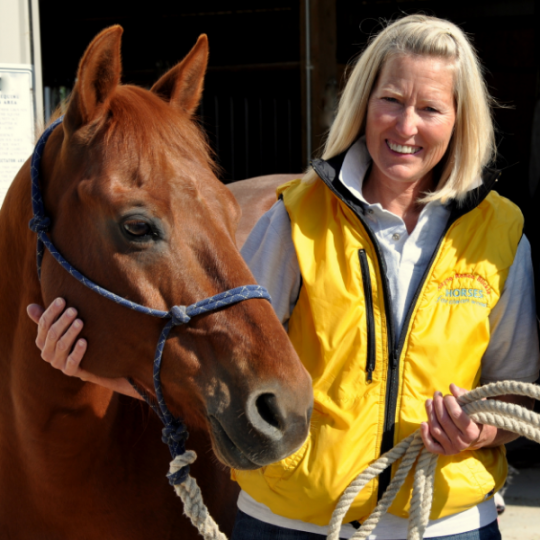 At the Summit, she will present on an array of concerns surrounding horse property management. Here, she writes on dealing with springtime mud on horse properties. Across North America, horse properties are showing the repercussions of a wet spring – muddy paddocks with miserable horses and unhappy humans managing them. Living in mud creates an unhealthy environment. Mud harbors bacterial and fungal organisms that cause diseases such as abscesses, scratches, rain scald and thrush. 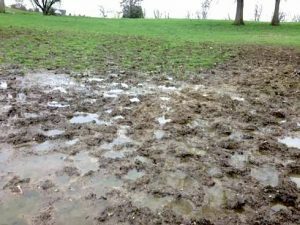 Mud is also a breeding ground for insects, especially mosquitoes and filth flies. Horses fed on muddy ground can ingest dirt or sand particles leading to sand colic. 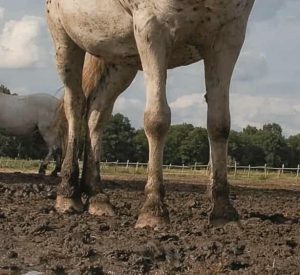 Mud also creates slick, unsafe footing that can cause slips and injuries (for horses and humans) Mud also has serious environmental impacts, something we need to consider in a time when we’re each striving to reduce our impacts on the world. Mud carrying runoff of sediments and nutrients from manure can get into streams, ponds, and wetlands. This can be detrimental to fish, shellfish, and aquatic wildlife. You don’t have to live near a creek or lake for this to have a negative impact as nutrients and sediments can also cause problems for ground water, too. Create a sacrifice area or paddock to be used to keep your pastures from becoming overgrazed. This area should be on higher ground, away from ditches, creeks, or water bodies. Using a sacrifice area keeps horses from destroying pastures. It also confines manure and urine to an area where you can more easily manage it. Surround this area by a grassy buffer such as lawn or pasture to act as a filter for contaminated runoff. Using a footing in this area such as coarse washed sand or crushed rock will help cut down on mud problems and will make it easier for you to care for. Use some type of non-dirt footing in sacrifice and high traffic areas. Use of a footing material will cut down on mud problems by keeping horses off the dirt and allowing rainwater to percolate through. Popular choices include wood chips, gravel, or sand. Wood chips have the added benefit of helping to breakdown the nitrogen in the horse’s urine and manure. Use three to six inches of footing throughout your paddock depending on how deep your mud is. Pick up manure in your paddocks and sacrifice area every 1 to 3 days. This is important for your horse’s health because it reduces parasite reinfestation and it will greatly decrease the build-up of mud. 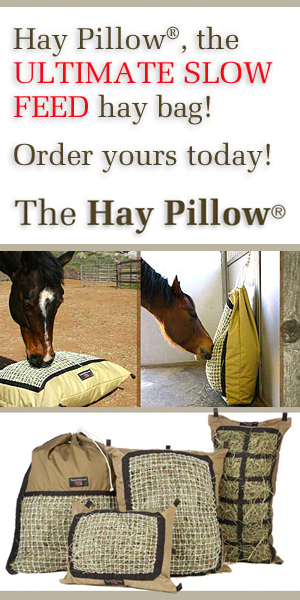 While you’re at it, pick up stray clumps of bedding or leftover hay. All organic material eventually decomposes and leads to mud. Tarp the manure pile. This will keep your manure pile looking like a pile of compost and not a pile of mush. The nutrients you are trying to save will stay in the compost and will not get washed out into the surface waters where they can cause problems. Store manure as far away as possible from streams, ditches or wetlands to avoid more mud problems and potential environmental impacts. Deal with drainage. If surface water runs into your barn or paddocks, look for ways to divert this water away. Possibilities for dealing with drainage issues include French drain lines, water bars (like a speed bump for water runoff), grassy swales, or dry wells. Install rain gutters and roof runoff systems on all barns, sheds and outbuildings to divert clean rainwater away from high traffic areas. This will reduce the amount of nutrients (from manure and urine) and sediments (from soil) washed off into surface waters. This also has the added benefit of substantially reducing the amount of mud created in your sacrifice areas –and it keeps clean rainwater clean. Cross fence pastures and rotate horses in order to prevent overgrazing and soil compaction. At least three inches of leafy material is needed for rapid regrowth and for the biofiltration of nutrients, sediments and chemicals. Compaction of the soil – which makes water infiltration and root growth difficult. Potentially increased vet bills if your horse eats toxic weeds. Plant and maintain native trees and shrubs. Plants use a lot of water and can potentially reduce the amount of water around your horse place. A mature Douglas fir can drink 100 – 250 gallons of water per day. Evergreens have an added advantage in that they keep on using water in the winter when deciduous trees are dormant. Using water-loving native shrubs along the outside of paddocks may help keep the area dryer and it will reduce runoff. Examples of plants that might work include willow, cottonwood, red osier dogwood, and hybrid cottonwood. Reducing the amount of mud on your horse place will create a healthier place for your horses, a nicer place for you to enjoy, a prettier picture for you and your neighbors, and a cleaner environment for all. Posted in BestHorsePractices Summit, Health and tagged alayne blickle, mud and horses, mud in paddocks, mud management. Looking forward to seeing you at the conference – great information! It is EMBARASSING how most people with horses keep their pastures… bad for their horses (mud), bad for the soil and erosion, and bad for their pocketbooks… but it also LOOKS awful.